From 1870-1885 Ogallala, Nebraska was the destination of countless cowboys driving cattle north from Texas to the railhead. 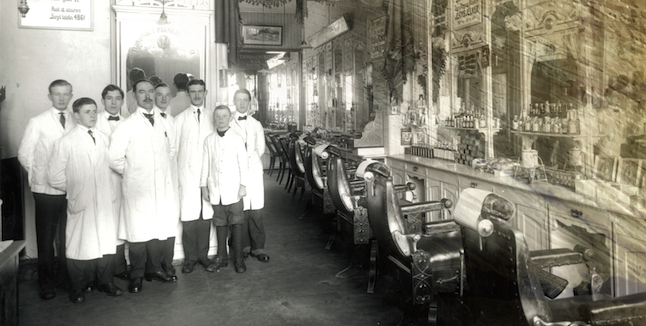 It’s a sure bet that as the boys hit town one of their first stops was a barbershop for a bath, shave and a haircut. After being splashed (quite generously) with the barber’s own special mix of Bay Rum, he was ready to hit the saloon and talk to the young ladies who were anxious to sell him drinks…we’ll leave it at that. The decades have taken their toll on dance hall girls and that great old fragrance – Bay Rum. While we can’t do much about the dance hall girls…(Nobody’s wives will let them) we can bring back that great old-fashioned Bay Rum fragrance! Genuine Ogallala Bay Rum is simply the best you’ll find!